Covet them sneakers? Find out how to buy your own pair here. There's been some pretty famous footwear throughout history. There's Cinderella's glass slippers. Elvis' blue suede shoes. And who could forget Dorothy's ruby red shoes in the Wizard of Oz? Well, we now have another celebrated shoe to add to the list. Last Thursday, when Elon Musk presented the Model Y on stage at Tesla's Hawthorne design studio, he was sporting custom-made, Tesla-logo Nike's, and now they're the talk of the town. It seems everything that Elon does these days is news, so why would we be surprised that his sneakers made headlines also? To complete the story, Alex from E For Electric reached out to Marco Acosta, co-founder of DM Customs, the company that made the sneakers for Elon for his reaction. Acosta told Alex that they are going to be making six more copies of these sneakers, and are selling them for $1,500 per pair. 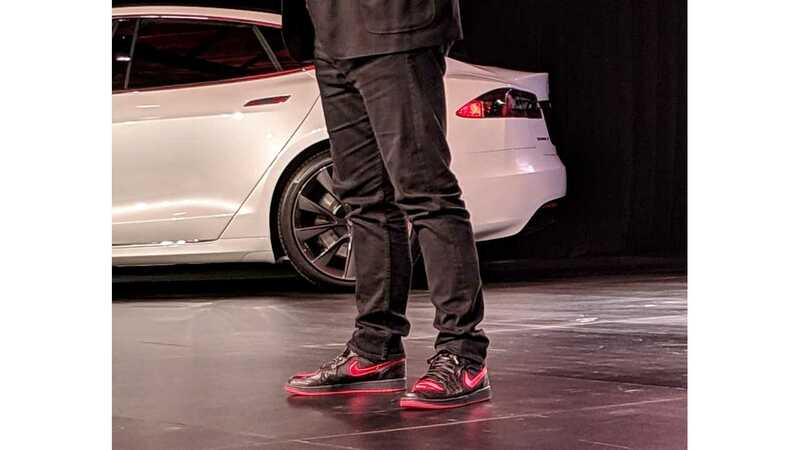 So, if you really love Elon, here's your chance to sport the same very-limited-edition custom Tesla sneakers that he wears. It sounds like a crazy amount to spend on sneakers, but with a total of only 7 pair ever being made, and with the notoriety of Tesla and Elon, these could end up being a good investment if you hold onto them for a while. Limited-edition sneakers are big business. You may remember the limited-edition Nike MAG Back To The future sneakers. The reproductions sell for many thousands of dollars, and one of the originals sold for over $92,000 last year.